THE FRONT ROOM is a great new weekly Sunday afternoon club featuring stripped down sets from great bands and solo artists. 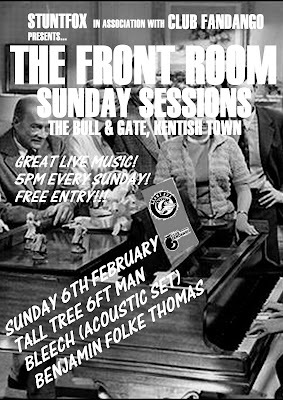 The first Front Room session is happening this Sunday featuring Pointy records latest signing Tall Tree 6ft Man.A Cambridge based 3 piece. with 3 minute pop songs that feel like twenty minute epics... "their debut wields a scalpel, dissecting the literate pop of Prefab Sprout and splicing it to hazy psychedelia." (Q Magazine). The wonderful Bleech are in the middle spot. They're a great live band but it's sometimes possible to overlook their songwriting talent due to their excitingly visceral live shows. Today they play an acoustic set so listen up! With abeautiful debut mini-album out on Bucketfull Of Brains Benjamin Folke Thomas is set for great things in 2011. But instead of waiting to watch him from a 20,000 strong crowd in a muddy field this summer come and cuddle up to his songs in our intimate Front Room.